Home/Small business computers, VOIP, Networking, VPN, Internet security, Wireless Hot Spots, Home entertainment, Home security, Home control. Where it may be one small computer that is just connected to the internet, a total business solution, network that needs security or a iPhone setup on exchange server, a home theater system streaming video and audio from your computer, to whole home packages incorporating home theater, control of lights/aircon/security and all computers remotely. 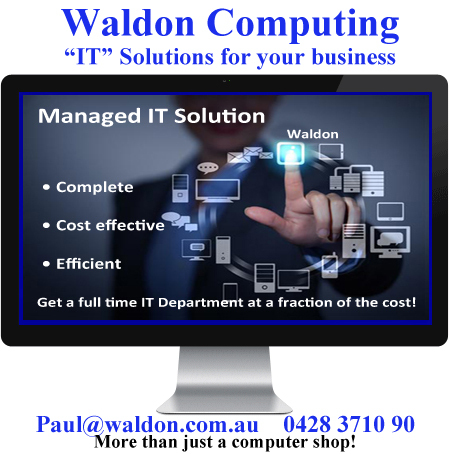 We at WALDON can help you to sort through all the information and set up a package that suits YOU. There are hundreds of products on the market in each of the above categories and 90% of these can not be integrated smoothly with each other to have a seamless and easy “Whole of Business” system! With careful planning with the client – we can design a package to suit any budget and create a system that is not only functional but also easy to use.